C-Vantage Hospital Management System Software has been designed and developed for Hospitals, to provide them the finest way of managing their organization. We aim at bringing quality in patient care & management with various important utilities like easy & quick patient registration, instant access to patient's complete health hsitory, integrated patient module with various other related departments and many more. Our Hospital software focuses on excellent coordination between Healthcare organizations like Hospitals, Polyclinics & Clinics, and patients, making e-health a very successful and effective approach. 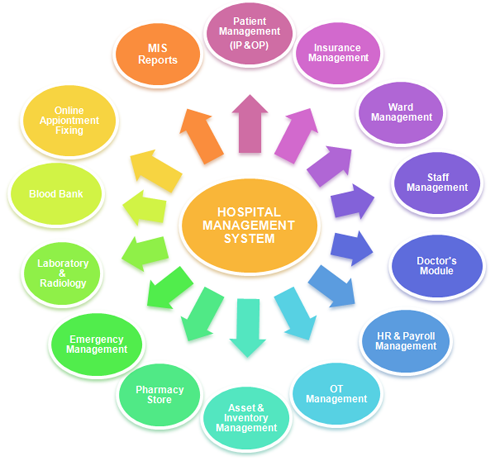 Basically Hospital Management System (HMS), Hospital Management Information System (HMIS), Hospital Information System (HIS), Hospital Billing Software or Hospital Software are synonyms of e-Health Management System with a specific goal of making a hospital management easy, effective, precised and paperless. C Vantage a Hospital ERP Solution provides the benefits of streamlined operations, excellent patient care, effective cost control and very importantly enhanced and secured administration & control. Our HMS is robust, interactive, user-friendly, flexible and is designed and developed to deliver real benefits to all level of Hospitals i.e from multispecialty hospitals to small clinics. More importantly it is supported by a very reliable and dependable Coelentera support. Our HMS covers a wide range of hospital administration and management processes in terms of Management modules. It is an integrated end-to-end Hospital Management Information System that provides required information across the hospital. It effectively supports decision making for patient care and hospital administration in a seamless flow. This Hospital Management software is reliable and assures complete security of data. It has been designed keeping in mind today's complex requirements and the importance of TIME. It uses a browser-based and user friendly interface which helps users to view the content very fast. The Hospital software is developed in a fully Internet/Intranet environment and runs on all browsers. And many more modules which can be chosen as per the standard of the Hospital can be seen in detail in the HMS modules section below. Highly interactive, user-friendly and flexibile to fit and inherits all flows of management of Hospitals across the countries. Make your Hospital performance better by simplyfying operations and optimizing productivity and increasing revenue. Cost Reductions and quality patient care. A single integrated system of all management processes. Advanced, Paperlless and a comprehensive management system. Always prefer software instead of manual system, it not only reduces the chances of making errors but also increases the performance & speed of the entire system. Compliance to international health care practice, ICD 10 Integration (WHO standard for Physician’s Disease diagnosis), for better diagnosis and treatment of Patients. Electronic Medical Record (EMR) utility which helps doctor to retrieve patients all diagnosis records and thus help in better treatment. Better quality of care, procedures and service to patients with enhanced data security. Capable of handling large database. Lakhs of Patients and Staff data being stored and fetched easily with the software. Patients can be given medical ID card with the help of software. Proper and individual training to staff members will be given who are going to be assigned with specific privilege to access the software. Online appointment utility. Patient can fix an online appointment with the doctors, sitting at their home itself. Doctors available timing to book an appointment will be easily accessible to them. Cost effective and least manpower is required with the use of this hospital information system software. Less number of staff will be required to cater more patients in same time or even less by using this software. Special feature of internal communication system enables staff to communicate among themselves for any such discussion where they need to physically visit other staff’s cabin. Followed by document sharing system which also helps them to send any document need to be shared with any other staff. Our software better enables to improve the response time to the demands of patient care because it automates the process of collecting, collating and retrieving patient’s all information quickly. Thereby allowing doctors to spend their precious time more in clinical activities. Robust Architecture using latest Technology. It enables security for future by giving latest technical platform which allows us to enhance as per rising needs of Hospital. And a strong architecture makes a reliable platform to carry out all hospital functions hassle free. Advanced Business analytics has been designed for the system to provide enhanced performance towards better and frequent decisions. Modules can be chosen as per the requirement of Hospital. Saves unlimited number of Images as required. Stores Patient visit wise details by giving unique identification for future reference. Best Hospital Software for the Hospitals searching for Hospital Billing Software as we have an instant Patient Enquiry and quick Billing system. MIS Reports for the administration to keep watch of all departments data flow and their inputs. It can be searched on daily, weekly, monthly or yearly basis. Centralized, Interactive and User-Friendly, even non computer experts can easily work on it. Runs on PC, Laptops, Tablets & Mobiles. Excellent and effective software for hospitals helping in providing good connectivity among departments with complete security and privacy features. This module manages all ward related information. Master pages are present in this module to handle various categories like Wards entry, Room Types, Room Numbers and Beds. It also shows the bed availability status and allows changing the status for Patient’s allocation as well. Provision to add reference range for each test, category wise. Provision to add sample types and lab units being used. Create Profiles and packages for Particular tests. Provision to add collected sample detail. Easy creation of lab reports. This module allows registering all operation theatres in Hospital and booking them in advance if any request comes. It also manages operation types, anesthesia type, Equipment details in OT including their usage charge and so on. Also, we can search patients who have gone through any operation / surgery and get their details like operation date, operation type, operation room number and surgeon. In this module a small patient registration form is available which is quick and easy. Responding to the criticality of the situation, our application lets the user to register a patient with minimal details so as to start the procedure fast. It has a provision to store details about condition of patient during arrival. It also allows moving a patient from emergency area to wards. Provision to add Insurance company Type. Provision to add insurance type and plans. Provision to claim insurance fast and send it to the company for authorization. Provision to set doctor’s available timings. Easy doctor’s search as per the specialization required. Patient can request for online appointment. Doctor’s occupancy report can be seen in detail. Doctors can view all their appointments booked. List of outpatients and inpatient allocated under their care. Provision to diagnose and assign test. Prescription writer with pharmacy drug database access. EMR module is a real time, secured, point of care and patient centric platform for doctors. It supports doctor by providing access to patient’s health record information and evidence based decision support. It streamlines the doctor’s workflow, closing all loops in communication and response that result in delays or gaps in Patient care thereby providing high quality cost effective and efficient patient care. It provides access to patient’s relevant information like diagnosis, medical examinations, treatment history, test results, prescriptions given and so on. Patient charting with patient’s assessment detail, vital signs and other nursing notes. Clinical modules that provides nurse the relevant information which can be viewed and analyzed. Better drug administration as prescription is done electronically and is more legible. Bed occupancy details will be visible. Admission or discharge activity can also be handled here. Transfer of patient from one bed to another can be done from here. Provision to add service charges of Hospital. Inpatient and Outpatient cash and credit billing. Authorize billing and immediate claim request process in case of insurance patient and collection of cash otherwise. This module is an innovative and special feature in C Vantage hospital management system software. It enables all staff users to communicate among themselves electronically for official reasons rather than visiting the concerned person for any such discussions. Departmental message can also be sent by administrator which is common to the staff of that particular department. In a same way any kind of document can also be shared among other staff as per requirement. Thus reducing paper work and saves good time to utilize it in a better way for hospital management. Create and manage ICD codes for diagnosis. List of emergency cases treated.